Now you can enable Two Factor Authentication in your Facebook Account and secure it with extra security layer. When two factor authentication is enabled on your Facebook account and you login on Facebook, first you have to enter login PIN which sent on your registered mobile number and then you can access your account. An unknown person can not log in to your Facebook account, to login he has to enter an OTP / password PIN, which will be received on your phone. Two factor authentication strengthens the security of your Facebook account and you can secure your fb account with brute force hacking attack. There are many places like Google account, Microsoft account, and Internet banking where two factor authentication will be used to fully secure your account. Today I’m going to tell you how you can enable two factor authentication in your Facebook account. In Settings, you have to click on Security and Login. Under Security and Login, you have to click on “Use two-factor authentication” in Settings up extra security. If your phone number is not registered, first click on Add Phone and register your Phone. After adding the phone number, you can see currently Two-factor authentication is off. To enable click on Setup. After you enable the Two factor authentication, you can see the on signal. That’s it, now the extra security layer has been added to protect your facebook account. Now whenever you login to your facebook account from an unknown phone / PC browser, you will be asked an OTP / password Pin which will be received on your registered mobile number. For your private PC browser which is your trusted computer, you can set turn off this feature so when you login on trusted pc browser you don’t need to enter login pin. To turn off two factor authentication for trusted PC browser, you have to select Save browser option after entering login PIN. 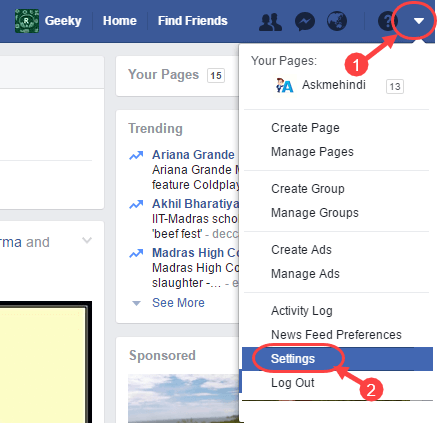 So friends this is how you can enable Two Factor authentication in your Facebook account. If you are more concerned about your privacy and feel that my facebook account is not secure then you can enable this feature. Specially if you are access your FB account at cyber cafe or friend’s PC then you must have to enable 2-factor authentication to protect your account and privacy.